Dancehall artiste Blak Ryno spent a night in jail for an alleged attack on his neighbour at his Winchester Estate apartment. The singer was slapped with two charges of unlawful wounding and assault occasioning bodily harm as a result. Police say the incident stemmed from a dispute over unpaid water bills by the artiste, whose real name is Romane Anderson. Reports are that about 7:15 p.m. on Saturday, the complainant, who is chairman of the strata committee at the apartment complex, was in a long-standing dispute over unpaid water contributions, which is mandatory for residents. Police reports indicate that the altercation got ugly when the complainant was accused of damaging pipes, resulting in loss of water to Ryno's home. During the argument, Blak Ryno is alleged to have kicked the complainant to the ground and kicked him repeatedly all over his body. This is said to have resulted in cuts to the complainant's shoulder and both elbows, as well as swellings on the side of the head, back, face, stomach and chest. 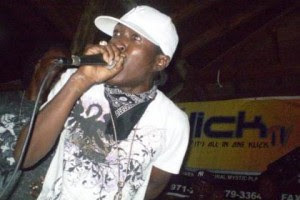 A report was made to the Half-Way Tree Police Station and the artiste was arrested and charged. Ryno claims the charges brought against him are unjust. "From yu hear dat u mus know a lie. Di non-payments cause by my landlord, and him (complainant) know that, but him want a reason fi come a style man caa him dun seh me as a ghetto yout nu fi deh deh (don't belong there)," . He also indicated that the police charged him based on the complainant's report. "From long time dis man a do tings fi try draw me out so him can do dis ... all walk him dog come piss pon mi mat regular an dem nastiness deh. Di ting did get physical after him walk come over my apartment, which is way down a corridor from his own, with his dog," Ryno explained. He continued, "Me have nothin' gainst dogs, but dis one rush me, so mi ease (kick) him off wit mi foot in defence and dis man box me, so a suh di ting get physical ... mi did mad seh him mash up mi water pipe dem yes. All police weh come fi arrest mi seh him wrong." Efforts to secure station bail for Ryno proved futile on Saturday night, as the complainant told police Ryno had threatened his life, so they decided to hold him for the night. But that night of incarceration was an experience Ryno says didn't bother him, as the overwhelming eruption of exuberance from prisoners at the jail made him feel more welcome than at his 'uptown' apartment complex. "It come like a Gaza mi deh although mi deh a jail, caa every man in deh a seh Gaza ... mek yu feel comfortable fi know nobody nah do yu nothing. Imagine mi cyaa get da peace deh whe mi live," said Ryno. A police source confirmed that the response from the jailed men was overwhelming. "As dem hear is Blak Ryno in jail with them you could hear the pandemonium from the station, which is a separate building ... look like a whole heap of Gaza fans we have lock up, so I can imagine how many songs Ryno sing," quipped the officer, who requested anonymity. Blak Ryno is scheduled for court on October 21.